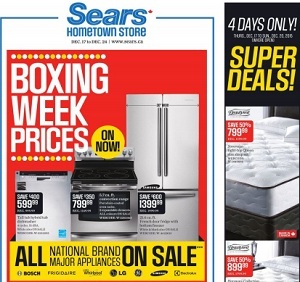 Featured offers in this Sears Boxing Week 2015 flyer valid 12/17-12/24/2015: $599.99 Kenmore Tall Tub Hybrid Tub Dishwasher; $799.99 Kenmore 5.7 Cu. Ft. Convection Range; $1399.99 Samsung 21.6 cu. ft. French Door Fridge with Bottom Freezer; $1099.98 Kenmore Laundry pair; $499.94 Kenmore 18.2 cu. ft. Fridge with Bottom Swing-Door Freezer; $799.99 Beautyrest Sovereign Tight-Top Queen Size Sleep Set; $899.99 Beautyrest Harmony Collection Cavelli II tight-top Queen size sleep set; $1299.99 Yard Machines 28″ Snowblower; $149.99 Craftsman 1/2-HP Chain-Drive Garage Door Opener; $549.99 Kenmore 5.3 cu. ft. Self-Clean Coil Range; $899.99 Samsung 5.9 cu. ft. Smooth Top True Convection Range; $849.99 Frigidaire 18 cu. ft. Fridge with Top Freezer; $1099.99 Craftsman 24″ Snowblower; $499.99 Pro-Form 415 Crosswalk Treadmill; $799.99 NordicTrack T6.5 S Treadmill; $199.99 Kenmore Quick Clean Performance Bagless Upright Vacuum; $139.99 Breville Café Roma Espresso Maker†; $799.99 Kenmore Tall Tub Dishwasher; $349.99 Kenmore Tall Tub Dishwasher; $799.99 Bowflex Xceed Home Gym; $99.99 Kenmore Canister Vacuum; and more. Find all deals and offers in the latest Sears Boxing Day 2015 sales flyer for your favorite local store.